Junie Moon was kind enough to let me share this story with you. I stumbled on it doing a Flickr search for knitted washcloths. June loves to knit for a good cause and we are pleased to support her work. 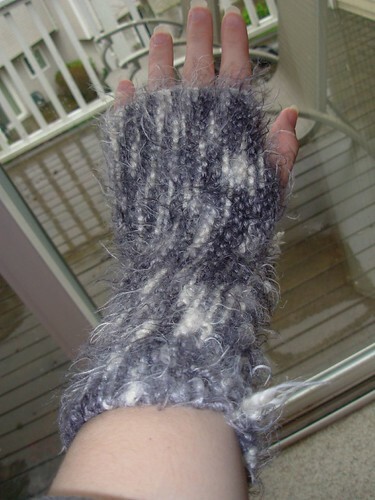 You can see all of June’s projects via her blog and Flickr site. My husband has us on a “watch all the James Bond movies in order” project. So, I am knitting a cotton washcloth per movie (I’m averaging 2 cloths per ball of yarn). The results are great for giving to the domestic violence shelter (psychologically semi-offsets the violence in the movies) or any other place where they will be useful. They work great in little kits: a washcloth, pretty bar of soap, toothpaste, toothbrush, etc. Repeat rows 1-4 until the washcloth is the size you want, end with row 2, and then BO. The washcloths in the photo went towards a couple of charitable endeavors. One was for Kelli Donley’s project to help an orphanage in Mozambique (http://www.africankelli.com/2007/04/17/giddyup/). We were tasked to fill zip-loc bags from a list of needed items. I made 10 packets and in each one went a washcloth I’d knitted along with soap, toothpaste, toothbrush, etc. and I added little toys to each. My little zip-loc baggies were chock full of as many goodies as I could squeeze in there. In addition to the orphanage project, I knitted some of the washcloths for domestic violence shelters as part of my support for Loves Many Cloths; they have a presence on Ravelry and host a Yahoo! group. Yet another one of my projects is the Junie Moon Bandage Brigade where we knit or crochet (individual choice) for Leprosy victims. This is something I host in January (although I still collect them—just received two packages recently). When they’re all collected, I forward them to the folks who make sure Veteran’s groups get them for hand-delivering to leprosy patients in Vietnam or Africa. I’m still struggling with knitting 101, so while I work out my issues, here’s a great collection of fun posts from the last week or so. Fancy Tiger: The World’s Longest Crochet Scarf: At the Denver Art Museum’s monthly Untitled event, the Fancy Tiger (a Denver boutique that specializes in independently designed/made apparel, accessories and craft supplies) taught museum goers some crochet skills and created the longest crocheted scarf in the world (currently at 115 ft). Sweater Surgery: Double-Sided Cable Scarf: Fall is right around this corner and this pattern from Stefanie Girard is a fix for the fact that cables don’t look so hot from the backside. Manchester Evening News: Knitting Cosies for Trees: Three knitters in Manchester, UK, have been knitting cosies (or cozies for us yanks) for trees. The project is part of the New Islington Festival. The knitting trio plans more knitted “urban yarn bombs” to brighten up Manchester and Salford. Knitting Daily: What Knitting Mood are You In? : This post and accompanying excerpt from Michelle Rose Orne’s new book Inspired to Knit will help you create a “mood board,” designed by you to identify what objects, colors, textures and patterns you’re inspired by and in the mood for right now. Sounds like a dreamy way to kick of a new project. 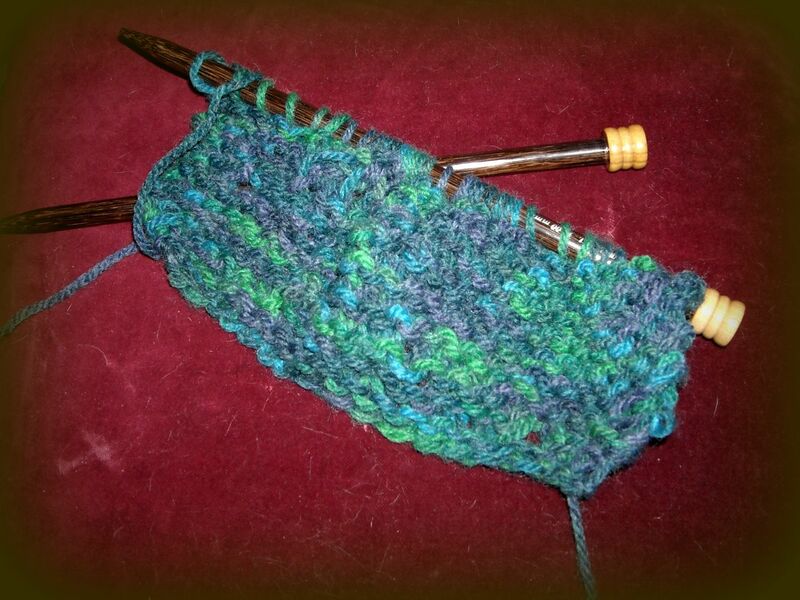 Kelbel (Ravelry member) was kind enough to share her first project story. I love this one! Basically, I knit a couple of rectangles, and (poorly) crocheted them together, leaving holes for the thumbs. They are all in garter stitch, there are a couple of dropped stitches that were poorly sewn up and they scream FIRST KNITTING PROJECT EVER! OMG! They are in my project file, if anyone is interested, in my projects page. But, those things are so darn warm, I don’t care who fusses about their look. I wear them proudly at work as a sign of confidence and perseverance. I have a really stressful job, and sometimes warm fuzzies help me get through the day! Later, I was at work, where it is deathly cold on graveyard. One guy was absolutely freezing, and his hands were nearly seizing up. Long story short, he ended up with wearing those gloves all night long! (Ironically, they matched his grey shirt!) He agreed they were very warm and worked super well. Apparently, I am now the boy scout of handknits. In my bag also were: two shawls, another pair of fingerless gloves and a wool hat. This winter, at no point did I have less than two hats and four pairs of mittens added into the mix. I am prepared. Tinkertots, a member of the “Soggy Stitches” group (for Eugenians and those who want to be) on Ravelry responded to my first story request with this great example of a first project. And, it turns out, she’s my neighbor! Small world. My first project was a cotton washcloth on bamboo needles. My mother and grandmother were visiting just after I’d moved here to Eugene and they brought their materials with them. I jumped right in. I’d say it was “hard” because it was my first ever project. 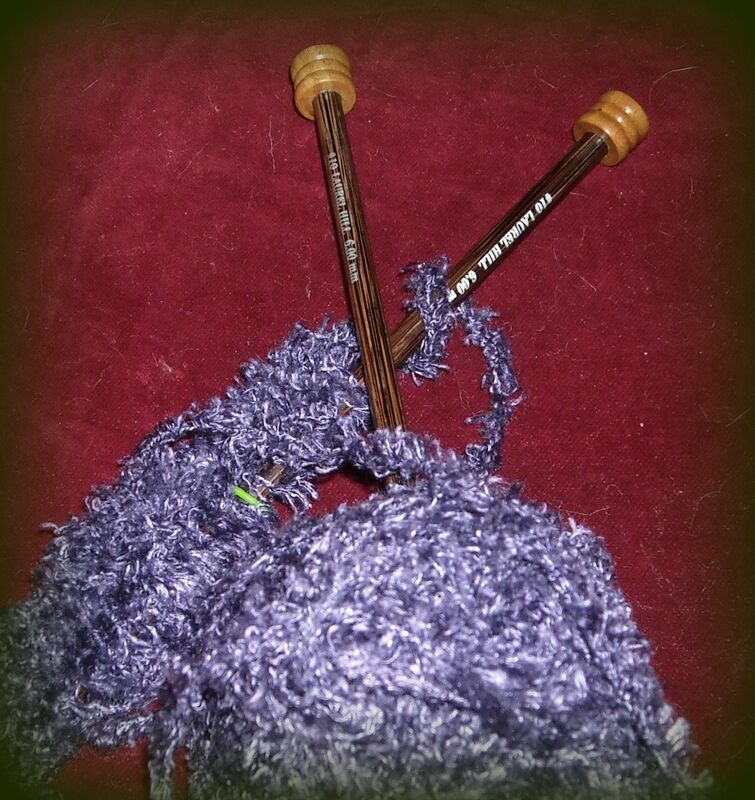 I was an insanely tight knitter and the cotton simply would not slide easily over the bamboo. I look back now and laugh. My next project after that was a jump into the deep end using Wool Ease and no pattern, only basic “how-to” instructions and a picture of some cables that I liked. I constructed my own purse with ribbing and cables down the front and a knitted strap… since I didn’t know what an I-Cord was (much less have DPNs at that point) I did it back and forth on straights and then seamed the whole thing shut. I still have it in my closet! If you’d like to make your own cotton washcloth, you can get a free pattern here. 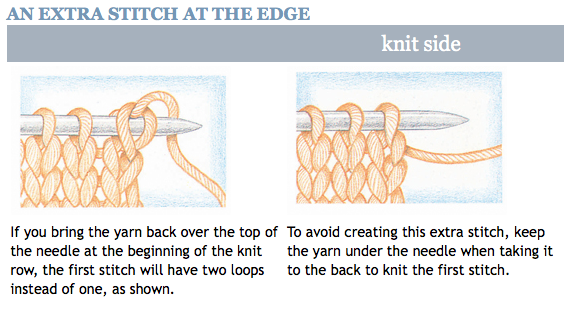 KnittingHelp.com has several great videos to help correct even more problems that I didn’t realize I had! (like twisted stitches… but I’m sure I do). If you know of any other good resources or tips, let them here! Beth at The Knit Shop was a terrific teacher. When I sat and concentrated on what I was doing and had her there to fix my oopses, things went great! The first day, I worked on a basketweave scarf sort of like this one. Knit 5, purl 5, knit 5, purl 5, etc. etc. It was looking pretty good. I left feeling pretty confident that this was something I could do and be good at. Then I tried it at home. The first stitch I tried to do, I immediately screwed up all of the rows I had worked so diligently on with Beth. So I tore it out and started over. And then again. And again. And again. I was determined to finish on a good note and knitted several rows that I felt ok about and called it a night. He had taken it out of the scarf-in-progress and stuck it through the fabric. Well, I guess he thought he was knitting. By then I was sick to death of starting over and over with the same darn yarn. So I went back to The Knit Shop and said that I needed to do something “fun.” Beth laughed and told me to look around, pick some yarns out let me know if they’d work for such a beginner as me. I ended up with Chinchilla yarn in Violet. Other than the fact that I keep adding stitches to the point that I have almost double what I started with after just 15 or so rows… it seems to be going ok. Pretty sure I’ll start over again. I’m such a perfectionist. I also got some bigger needles. The Laurel Hill size 15 are substantial needles, there’s no getting around it. I went back to the first yarn for a bit and came up with this sloppy mess. 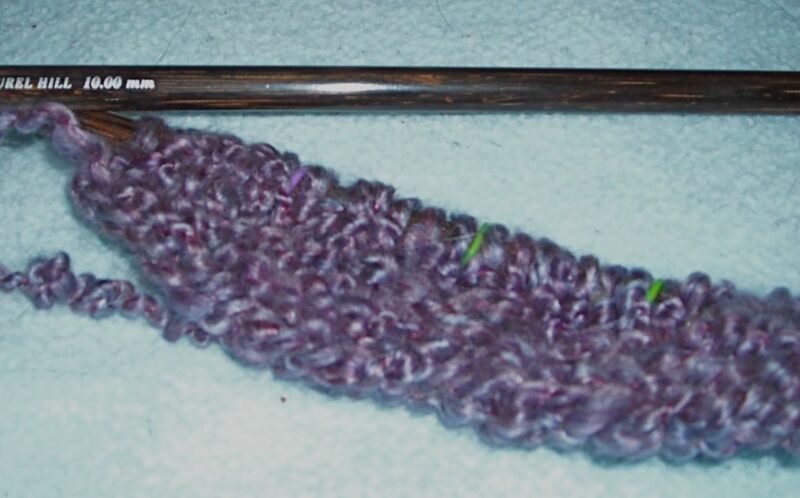 Finally, I started working on a different yarn – Lion Brand Homespun in Baroque with the big needles. I probably should’ve gone back to The Knit Shop to find “big needle” yarn, but it’s about a 30 minute drive and with gas prices these days… thought I’d pick something up at a department store to try it out. This is the first go and I think I’m going to take it out and start over, but we’ll see. I like experimenting with different yarns to see what the effect is. Eventually, I’m sure, I’ll start knitting like a grown up and will actually finish something that’s relatively free of slipped stitches and added stitches – my two biggest weaknesses as I see them right now. My best friend also learned to knit about the same time I did. She’s finished her first scarf… show off. But at least she’s having the same problems that I am. That makes me feel better. 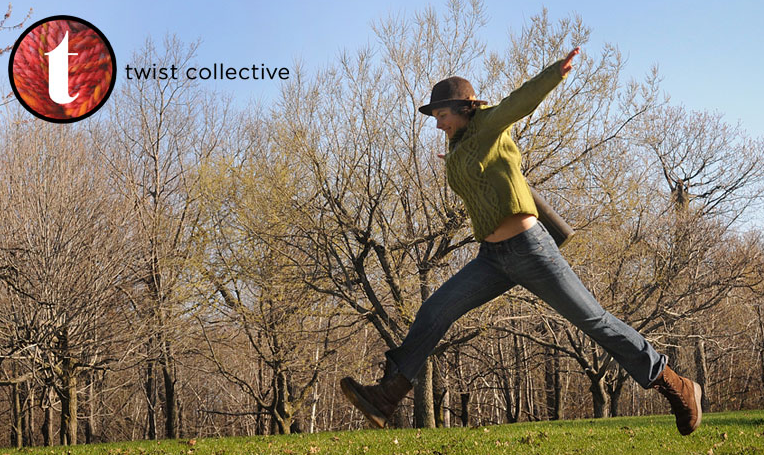 Thanks to Stephania at Moirae Knitting, I found out about Twist Collective. Most of it is above this newbies head, but someday when I can actually knit like a grown up, I would like to make this or this. 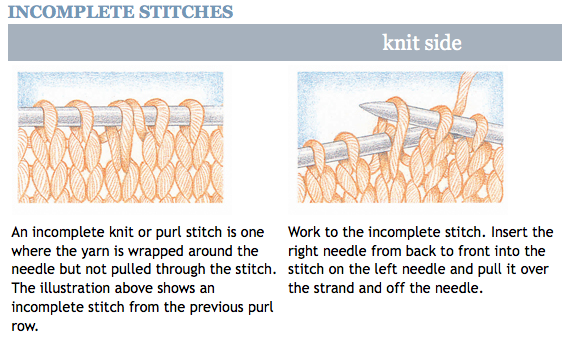 In the meantime, for those of you who are not new to art of knitting, check it out and let me know what you think.